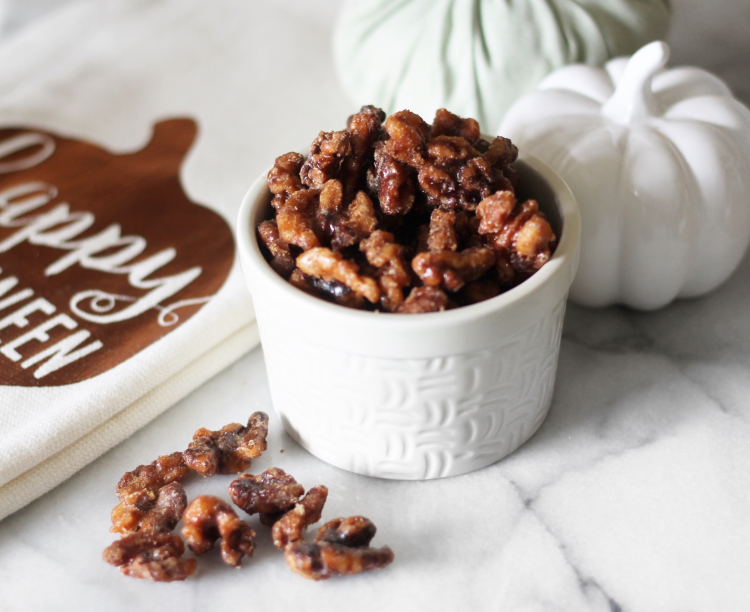 Pumpkin Spice Walnuts, the perfect recipe for all your gatherings this holiday season! They are so simple to make and your taste buds will be so pleased. Every time I make them they are all gone that same day. All it takes is one bite and you are addicted. If you are looking for something simple to make for Thanksgiving this is your recipe! Just make sure to double or triple the ingredients. Let me know if you give these a try! Spread walnut halves on cookie sheet. Bake for 10 minutes- stir after 5 minutes. Combine sugar, water, 1 teaspoon of Pumpkin Pie Spice and salt in a saucepan. Spread walnuts on a cookie sheet. Bake at 300 degrees for 10 minutes, stirring every 5 minutes. Remove from oven and toss the remaining teaspoon of Pumpkin Pie Spice.